Partial weightbearing status (<50%), unless otherwise ordered by MD. Walk with crutches. Heel lift in opposite shoe to normalize gait. Surgical knee will be in a hinged rehab brace locked in FULL EXTENSION for 4 weeks postop. Regular assessment of gait to avoid compensatory patterns. Regular manual mobilizations to surgical wounds and associated soft tissue to decrease the incidence of fibrosis. No direct palpation to surgical portals x 4 weeks. Consider the edge of the bandages as the “no touch zone” (approximately 2 inches in all directions). See Wound Care Protocol for full details. No resisted leg extension machines (isotonic or isokinetic) at any time. No high impact or cutting / twisting activities for at least 6 months postop. No resisted lateral movement for 12 weeks. M.D./nurse followup visits at Day 2, Day 14, 1 month, 3 months, 6 months, and 1 year postop. During the first 4 weeks: TWICE PER DAY: Without brace, allow GRAVITY ONLY (passive only) to bend knee back as tolerated BUT NO MORE THAN 90 DEGREES for a good knee stretch without increase in pain. Relax knee and stretch for 60 seconds. Nurse visit day 2 post-op to change dressing and review home program. Ice and elevation every 2 hours for 15-20 min each session. Soft tissue treatments for edema / pain control and to posterior musculature, ITB, add, quad, calf. No direct palpation of surgical portals x 4 weeks. Straight leg raise exercises (lying, seated, and standing), quadriceps/adduction/ gluteal sets, ankle pumps. Well-leg stationary cycling, upper body ergometer for cardio. Add upper body and core conditioning. Daily edge of bed dangle for passive knee flexion (allow knee to hang in pain-free range with light stretch). Passive range of motion 0-70 degrees. Gait: partial weight bearing (<50%) with brace locked in extension. Crutches used for gait. Continue with soft tissue treatment for edema/pain, posterior musculature, iliotibial band, adductor, quadriceps, calf. Continue with previous, manual resisted exercises (i.e. PNF patterns) of the foot, ankle and hip. Trunk stabilization program, three limb plank. Single leg balance and proprioceptive exercises. Aerobic exercises (i.e. unilateral cycling, upper body ergometer, Schwinn Air-Dyne with uninvolved leg and arms only, well body bike, single leg row machine). Passive range of motion 0-90 degrees. Gait: Partial-weight bearing (<50%) with brace locked in extension. Crutches used with gait. M.D. visit at 4 weeks post-op, will wean off the use of rehab brace. Stretching, exercises and manual treatments to improve range of motion (especially flexion). Initiate surgical portal scar mobilization if portals are completely closed. Incorporate functional exercises (i.e. partial squats, calf raises, mini-step-ups, proprioception). Stationary bike low cadence, low resistance. Slow walking on treadmill for gait training (preferably a low-impact treadmill). Gait- unlock brace; wean off brace and crutches. 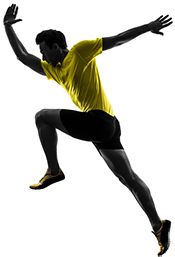 Emphasize proper gait mechanics. Passive range of motion 0-120 degrees. Continue as needed for ROM, decrease pain, muscle guarding. Increase the intensity of functional exercises (i.e. cautiously increase depth of closed-chain exercises., Shuttle/leg press). Do not overload closed or open-chain exercises. Gait- no limp present, good mechanics. Passive range of motion 0-135 degrees. Continue with soft tissue, joint mobilizations as needed. Add lateral training exercises (side-step ups, lateral stepping). Introduce more progressive closed chain and agility leg exercises. Patients should be pursuing a home program with emphasis on sport/activity-specific training. Consider road cycling in saddle. Initiate lateral training with no resistance. Complete 3 month sports test and initiate return to running program. Low-impact activities until 16 weeks. Increase the intensity of strength and functional training for gradual return to activities. Initiate resisted lateral training (theraband resisted side-stepping). Preparedness for Sports Test I for s/p 3 month checkup with Dr. Stone. Complete and pass Sports Test 1.